Silk or Fresh Wedding Flowers? Home > Flowers and Decor > Silk or Fresh Wedding Flowers? There are a number of important factors that may influence your decision about whether to choose silk or fresh flowers for your wedding. These will undoubtedly include the cost, availability, bouquet design and the theme of your occasion. Carefully considering the pros and cons of both choices will therefore help you decide which option is best for your requirements. If your wedding is planned for the summer you may not think that this would impact on your choice of floral arrangement. However, hot weather will make your bouquet wilt and sag, and will also mean that your flowers require more careful handling than a silk alternative. Whilst seasonal fresh flowers provide an excellent choice of blooms to choose from, opting for a durable silk display will reduce your worries on the big day. If your fresh flowers are also too fragrant this may induce sneezing amongst the wedding party, so it is worth checking and limiting the selection of blooms such as freesias, lilies, tuberoses and lilies of the valley. Although floral sprays may be used to scent your silk flowers, application of this can be controlled accordingly. Silk flowers are much more lightweight, flexible and durable than fresh flowers. Therefore if the weight of the floral arrangement is an important consideration – especially if you are planning to choose a large, trailing assortment – you may be inclined to avoid fresh blooms. The style of wedding gown, or outfit, will also dictate the shape and size of floral bouquet that would be most suitable, so it is worth taking a photograph of the bridal clothing along to the florist, when choosing the floral arrangements. Although fresh flowers provide a natural, eye-catching and fragrant option, silk flowers offer a wider choice in terms of colour matching. A silk floral arrangement can be made to match the exact colour of the bridesmaid dresses or whatever you are using to theme the wedding. 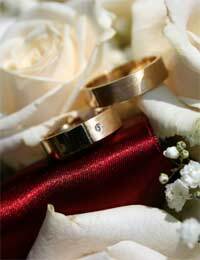 A silk bridal arrangement will also maintain its shape and design, and if stored correctly can last a lifetime. Although silk flowers offer a practical option, they can be just as expensive as a fresh arrangement. If you aren’t particularly concerned about preserving the bridal bouquet you may be drawn towards choosing a fresh flowers arrangement simply because fresh blooms provide an instant eye-catching appeal. The scent is also highly attractive. For many people fresh flowers are reserved for special occasions so a wedding provides the perfect reason to splash out on gorgeous blooms. Your wedding budget however, may influence the style and type of bouquets and table arrangements you decide to opt for, but being flexible in your choice will help reduce the overall expense. Although it is considered a traditional ritual for the bride to toss the wedding bouquet, many brides prefer to hang on to their expense bouquets. Florists will therefore make a smaller replica bouquet, which can be used instead. This allows the bride to keep her own bouquet in good condition. Do bear in mind, that the replica bouquet will be an additional expense.